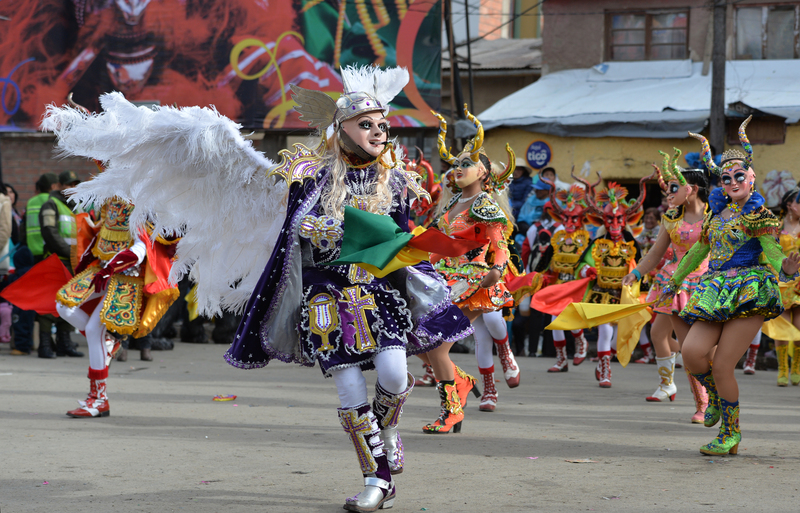 The Diablada is one of the most fascinating components of the Oruro Carnival. 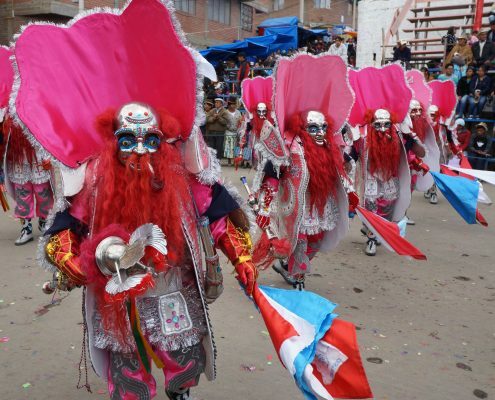 The Carnival of Oruro, Bolivia, justly ranks among the most famous pre-Lenten celebrations of the world. Oruro is a small city in northern Bolivia, formerly a base of the Uru-Uru tribe, and later a colonial center of tin, tungsten, silver and copper mining. Today, the mines are all but exhausted, and Oruro is far from being a mecca of tourism. Nonetheless, once a year the city attracts visitors from around the world to see its enormous and unforgettable Carnival parade, the Entrada. 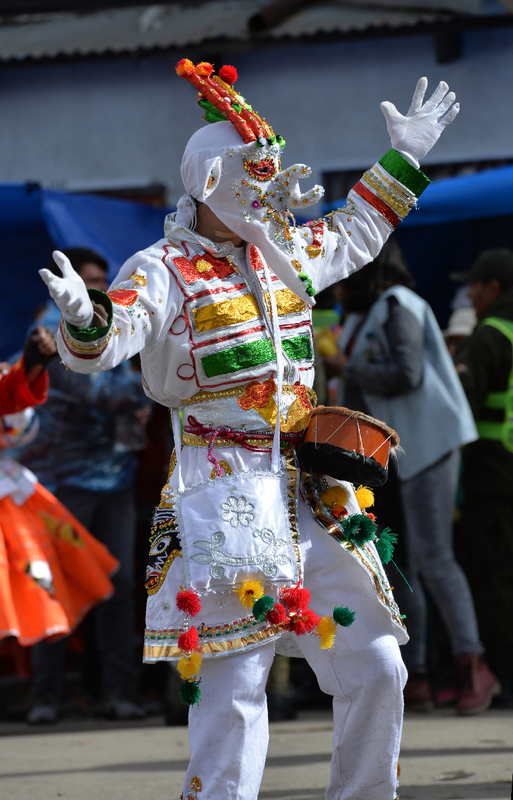 A Kusillo clowns for the audience during the 2017 Carnival of Oruro. The Oruro Carnival is organized by groups of mostly masked dancers in tin masks. Decades ago, many masks were made of linen soaked in plaster, but these were brittle and heavy. The move to tin reduced the weight and increased durability, allowing greater size and complexity of design. Very recently, fiberglass and plastic have been used, largely because tin dents easily and welded components frequently detach. The best known categories of masked groups are the Diablada, comprised of male (tio supay and diablos) and female (diablesas and china supay) devils; the Morenada, with its male (morenos and achachis) and female (chinas morenas) Moors; Negritos (black men and women); Jukumaris (representing bears); Waka Tokhoris (representing Spanish toreadors and the bulls they fight); Llameros (llama herders, both male and female); Chutos (representing the pre-colonial indigenous tribes); Kusillos (a kind of clown); and many others. The number of participating groups is in fact so numerous, and so many participants fill out each group, that the parades begin early in the morning and continue past midnight for at least two consecutive days. The scale of these parades is simply staggering. 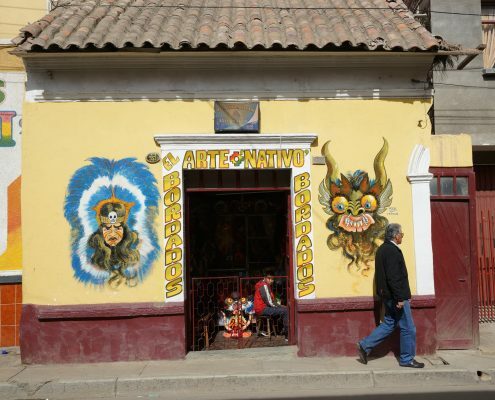 The masks are made by welding specialists called careteros who run small shops in La Paz and Oruro. 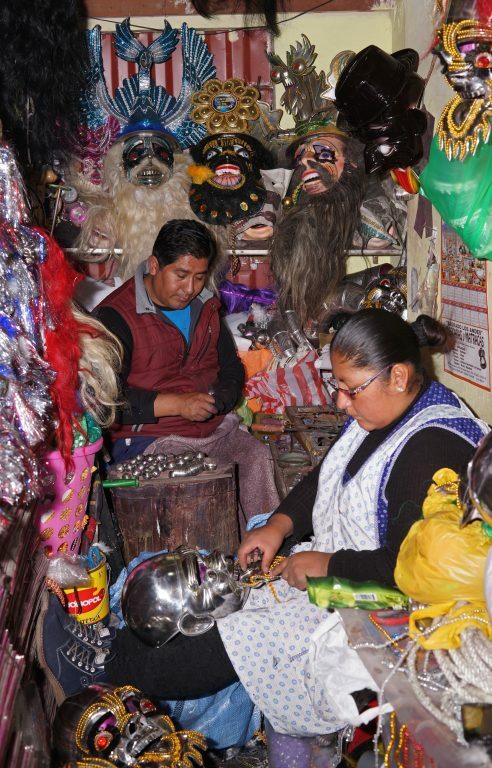 The elaborate costumes are crafted by bordaderos, who are usually clustered together with the mask makers. Over the years, the Diablada, Morenada, and Negrito costumes have become increasingly bulky, elaborate and detailed, so that the cost of a complete costume and mask is, by Bolivian income standards, imposing. Nonetheless, Bolivian pride in the Carnival is sufficient to make it one of the largest in the world. 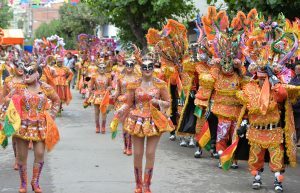 Adding to that pride is the fact that, in 2001, the Carnival was designated the Intangible Cultural Heritage of Humanity by the United Nations Educational, Scientific, and Cultural Organization (UNESCO). The Archangel Michael is an important character who formerly battled the demons but now leads them in the parade. 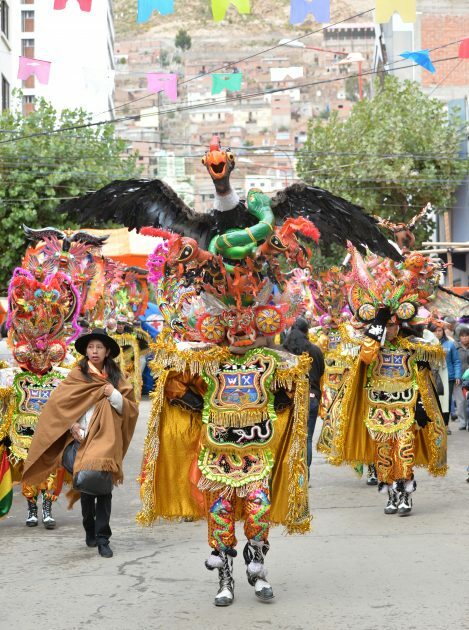 What is perhaps most interesting about the Carnival of Oruro is its syncretism between the traditional pre-Christian beliefs of the Andean peoples and the Catholicism of the Spanish invaders. Historically, the Diablada and Llameros were a form of worship of the Uru-Uru god Tiw. Although colonial authorities banned these ceremonies, they could not stop the secret continuation of the rituals by Quechua people and eventually integrated them into a liturgical Catholicism. The worshiped Tiw became reinterpreted as the Devil (as Catholics did with all native gods) and other characters given neutral or Catholic spins. 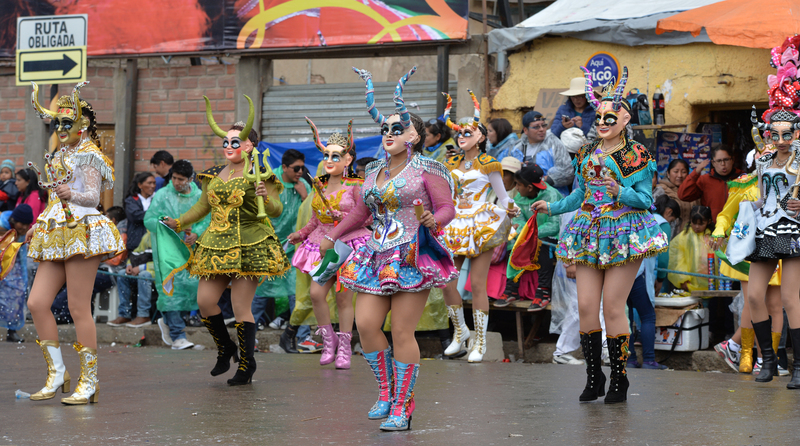 Coordinated dance steps are an unusual part of the Oruro Carnival. Two of the core historical elements kept alive in today’s are music and dancing. Large marching bands and traditional instruments accompany most of the groups, making the parade a loud and festive spectacle. Perhaps most importantly, the groups do not just march down their route. They dance continuously in celebration of Tiw, sometimes with traditional Bolivian dance steps and other times in choreographed routines, such as when the Archangel Michael leads his army of diablesas through a gateway of fire with high and fast steps. LED lights accentuate a diablesa in the 2017 Oruro Carnival. However, the Carnival of Oruro has evolved some modern elements. 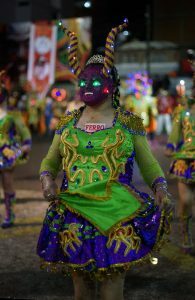 During the nighttime part of the parades, many groups now illuminate their masks and sometimes costumes with LED lights, creating a striking and colorful spectacle. Another element, popular not just in Oruro but the Carnival of La Paz and other towns, are “foam wars.” Onlookers in the crowd typically buy spray foam, a kind of soap-like chemical in a pressurized can, and sneak attack passersby and each other throughout the Carnival. Parade groups themselves are off-limits in Oruro, but in between parade groups, children sometimes descend into the parade route and wage foamy war on each other. 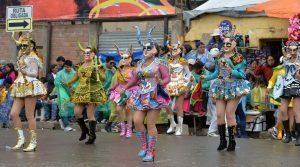 Attending the Carnival in Oruro is both difficult and costly, but for those who succeed, the reward is a cultural experience so impressive that it sets a standard few other parades can ever meet. A bordadero advertises its wares on the Calle La Paz in Oruro. 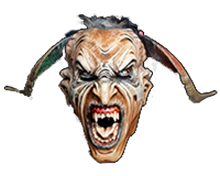 Some diablo masks are simply gigantic. This one includes an Andean condor, a national symbol of Bolivia. Morenos wearing unpainted masks in the 2017 Carnival. Careteros in the Calle los Andes, La Paz, weld and solder moreno masks. 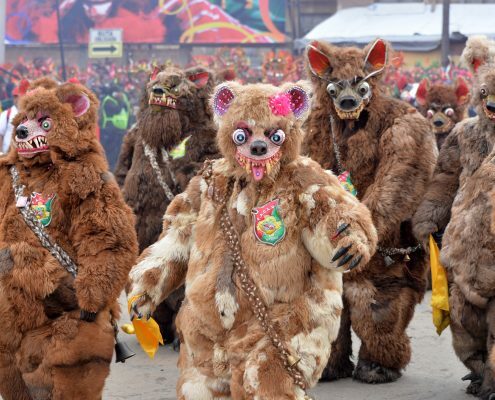 The jukumari, or (now extinct) indigenous bears, are some of the most popular characters of the Oruro parade. 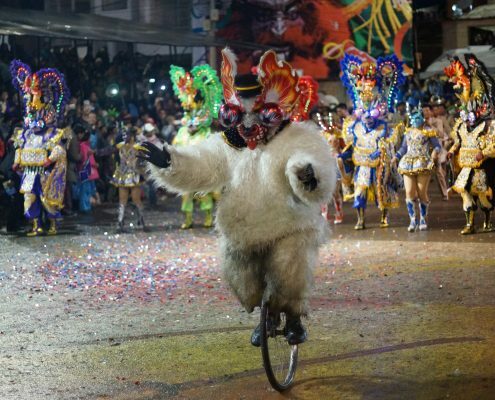 A talented jukumari rides a unicycle through the parade, at night and in a bulky costume, to the crowd’s delight.